Fine Dining Restaurant, Assiette has a sibling in District Dining, Warren Turnbull's more casual venue. District Dining has a lovely interior with small balcony featuring hight tables and bar stools. The waiters are attentive and come around frequently to refill water. The wine menu is generous and also features cocktails. Whilst wine menu takes on the traditional linear format, the food menu comes on a white sheet of paper and is horizontal and spread out. The waiter takes the order by ticking the dishes on the menu that you've chosen to order. The service on the night we went was quick for our first dish but then there was a major lag between the first dish and the second. When the second tapas style entrée arrived, it was followed by all of our mains at the same time. Suddenly our small table was covered in food and the waiter had to rearrange the plates to fit it all on. We then ate rather quickly to ensure all our dishes would still be hot when we consumed them. We started off with bread and olive oil. It was curious that it wasn't served with balsamic as well. However, the bread was soft on the inside and crusty on the outside and served warm. The two slices - one white and one brown were both delicious. 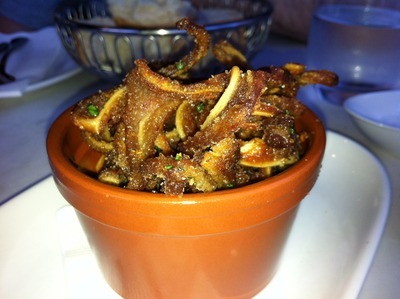 We then boldly decided to sample the pigs ears served in Szechuan salt - $10. (They have received great reviews). These were crispy, chewy and very salty. Whilst they were great to munch on, there are a lot in a serving and too many for just the two of us. We had a substantial wait before the quail eggs -$14 arrived. I ordered these as well because of their rave reviews but honestly could not understand the hype. 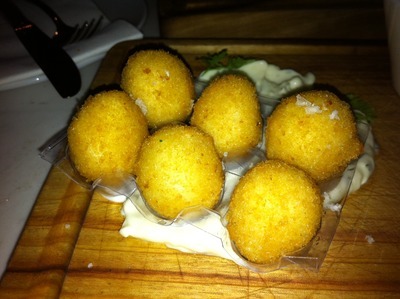 The crispy quail eggs came in a plastic tray and the tarragon mayonnaise was spread across the wooden board they were served on. The eggs were smaller, but as far as taste is concerned, tasted like regular eggs in a thin breadcrumb coating. The coating tended to slip off sometimes though. I would have liked to see them a bit runnier rather than hard boiled. 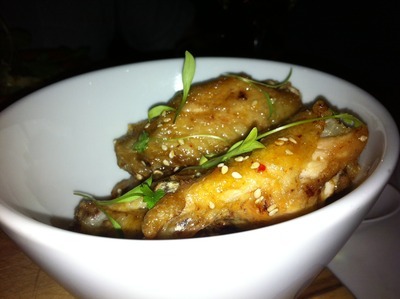 Our last entrée was the District chicken wings, chilli caramel -$12. These were moist and very nice, served with a finger bowl to clean off sticky fingers. The flavours in the sauce were not distinguishable though and they just tasted like honey chicken wings and were not spicy at all. We ordered two mains to continue sharing. 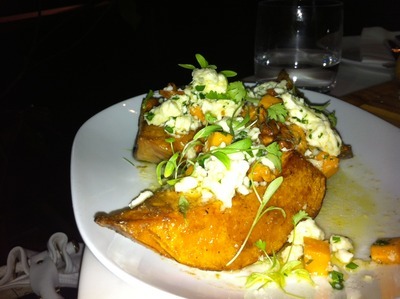 The first of which was the Spiced pumpkin, marinated feta, honey, walnuts -$18. This was a bit over priced for what it was. The pumpkin was on the firm side and after the chicken wings, it was too much of the sweet flavours. The feta broke it up quite well but from the four hunks of pumpkin we only got through two. 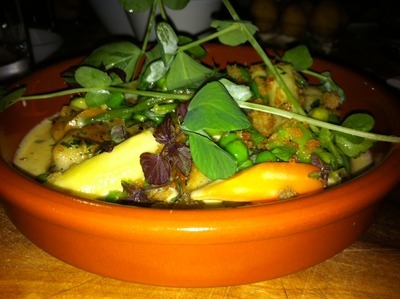 Lastly we had the gnocchi - $29, which actually doesn't appear on the online menu. It is served with soft veggies and a creamy white sauce. The gnocchi pieces are generous but there weren't many in the dish. This mean that this was slightly overpriced what you received as well. Whilst the dessert, which included Meringue, strawberries and cream, raspberry sorbet, Chocolate mousse, hazelnut brittle ice cream, hazelnut crumble and Cookie sandwich, coconut and chocolate, honeycomb parfait - all $14 each, we were too full to order anything. The parking in the area is difficult but not impossible.